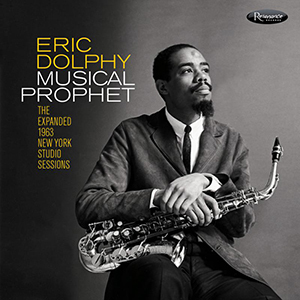 Musical Prophet is the first official release of previously-unissued Eric Dolphy studio recordings in over 30 years and includes 85-minutes of music never before released. The groundbreaking alto saxophonist, bass clarinettist and flautist brought us iconic LPs such as ‘Out to Lunch!’ and ‘Outward Bound’. The 3xCD package is beautifully designed and includes an exhaustive booklet replete with rare and never-before-published photos by Chuck Stewart, Jean-Pierre Leloir, Val Wilmer, Hans Harzheim, Lennart Steen, Roger Marshutz and many others, plus reproductions of the original album covers for Conversations and Iron Man. Includes five essays that cover different aspects of Eric Dolphy and his music by jazz author/scholar Robin D.G. Kelley, Douglas label manager Michael Lemesre, Japanese Dolphy scholar Masakazu Sato, and co-producers Zev Feldman and James Newton, plus words by John Coltrane, McCoy Tyner, Ornette Coleman and Charles Mingus. Captured after leaving Prestige/New Jazz Records, and just before recording the timeless classic ‘Out to Lunch!’ album, ‘Musical Prophet’ is a 3-disc set that contains the under-appreciated masterpieces ‘Conversations’ and ‘Iron Man’ recorded in New York City on July 1 and 3, 1963. Originally produced by Alan Douglas – most well-known for his association with Jimi Hendrix, but who also produced classic jazz albums such as ‘Money Jungle’ with Duke Ellington, Charles Mingus and Max Roach – the tapes had been stored in a suitcase with Dolphy’s personal belongings and given to Dolphy’s close friends Hale and Juanita Smith just before he embarked on his fateful European trip in 1964. This entry was posted in Featured Album and tagged eric dolphy, musical prophet, resonance records.